Your Sense of Self is responsible for the nature of your motivation. With a lack of Sense of Self, your motivation is unhealthy. Deep down inside you have a major quest that you have to solve which takes priority over everything else in your life. Your priority is then to find something to fill in that hole within your self, where your Sense of Self should have been. It can become your reason for living and leads to major stress and anxiety and to little, to no success. 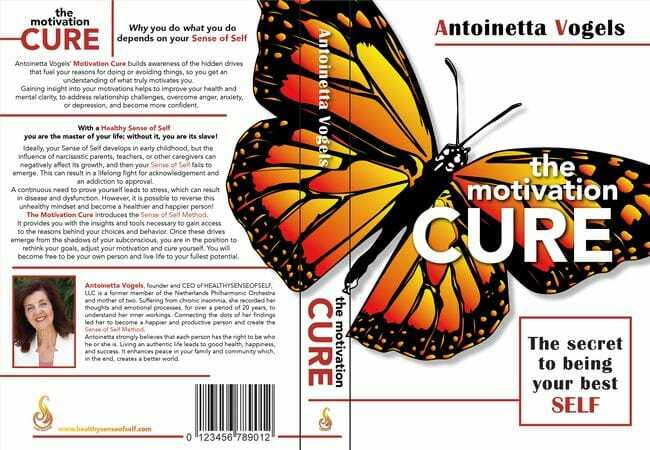 In my book the Motivation Cure, I offer the Sense of Self Method as a tool to establish that closer connection with your Self. Don’t get me wrong: your Self is always there but many people are not able to sense their Self. Learning to become more self-aware creates a stronger Sense of Self, which makes the reasons for WHY you do WHAT you do healthier, and your goals truly within reach. The ultimate objective is that your mental and emotional state is such that it supports you to live your life to the fullest. The book will be available by February 2017. Sign up for our Newsletter if you want to stay informed.